The Scarpa Boostic is an aggressive climbing shoe designed to boost up steep problems and pockety limestone routes with complete disregard to comfort. The Boostic has a high asymmetry and a tapered design that directs the entirety of the foot's power and your bodyweight through your big toe. Comfortable these are not; they're designed for absolute precision on hard boulder problems, technical sport routes, and power and support whilst pocket climbing. As aggressive as they may be, Scarpa have not ignored support. The Boostic uses a hard midsole to provide strength when stood in finger pockets and minimise foot fatigue on longer climbs. The V-Tenstion rand also reduces the pressure on the toes so holds and pockets can be stood on for longer with less pain. 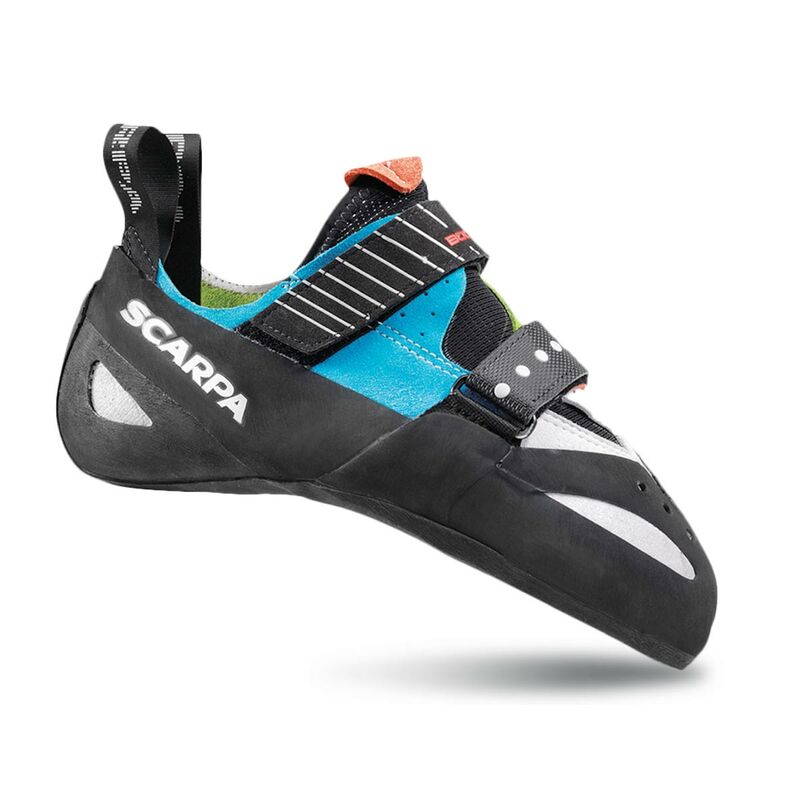 For technical moves, Scarpa have added a high-friction toe patch and constructed the heel with a tighter fit to grip and stability on toe and heel hooks. The Boostic feature a natural suede upper in the back of the shoe and synthetic in the front, so expect about a half size stretch. A randing system designed for maximum comfort in all-day shoes. It supports the front of the foot and helps extend the toes slightly for climbers who don’t like added pressure on their toes when they climb. I have never owned a shoe which grips on such tiny edges as well as this shoe. Yes it's pretty aggressive, not the worst i've owned for comfort. I can keep these on for a few hours even. Used them mainly indoors. Wicked good on technical climbs, overhangs and tiny edges. Can't emphasis how good at edging these are. The toe rubber is great for those toe hooks when upside down and needing the support. One of my favourite shoes owned. Not the best for smearing... but still capable. After trying several brands, SCARPA is by far the best fit for me. This shoe in particular has the ultimate shape, excellent performance and unparalleled durability. If it fits you, I would definitely recommend it.